OPINION: What if March Madness were about equity instead of sports? March Madness is upon us once again, with fans keeping close eyes on their brackets in the NCAA college basketball tournament. The perfect bracket? It goes beyond just picking winners. It adds a layer of excitement that gives each follower a personal stake in the tournament. Women’s bracket in the HCM Student Success Tournament. For larger version, click here. A few of us at HCM Strategists have been swept up by the hype. As much as we are sports fans, though, we are also policy nerds. That’s why we gave the classic bracket a twist. Instead of basketball, our March Madness bracket considers how well U.S. colleges and universities serve students, particularly those from traditionally underserved and underrepresented communities, and how well they help those students earn degrees. Men’s bracket in the HCM Student Success Tournament. For larger version, click here. With the lists of the men’s and women’s teams invited to the 2019 NCAA tournament in hand, we developed our formula and set out to see how the competition would fare if we selected teams based on their track records of closing equity gaps and ensuring student success. First, the access gap: The difference (in percentage points) between underrepresented (Black, Latinx, Native American) student enrollment and non-underrepresented (White, Asian) student enrollment at institutions. Second, the percentage of low-income students served: The proportion of students enrolled at the institution who are Pell Grant recipients. Third, the graduation gap: The difference (in percentage points) in graduation rates between underrepresented students and non-underrepresented students at the institution. And, finally, the graduation rate for underrepresented students: The overall graduation rate for underrepresented students at the institution. An institution could earn from one to four points for each metric. Four points were earned if the institution’s outcome was in the highest-performing quartile of scores, three points were earned if the institution’s outcomes were in the second highest-performing quartile, and so on. Scores for each metric were added, and then the institutions were ranked. This ranking determined the results of head-to-head matchups. The proportion of students enrolled at the institution who are Pell Grant recipients — the second metric — was used as a tiebreaker. The data are based on the most recent information available from the Integrated Postsecondary Education Data System. Who won our brackets? 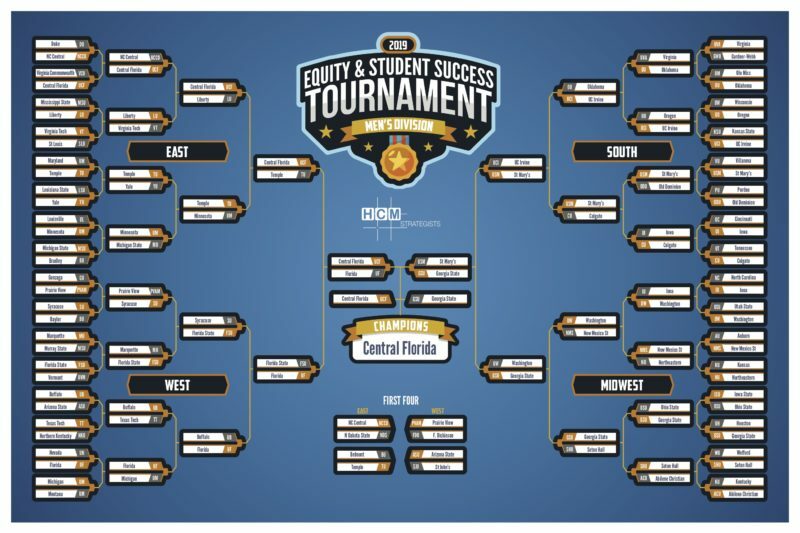 The National Champions for the Equity and Student Success Tournament are the University of Central Florida (for the men’s bracket) and UCLA (for the women’s bracket). Also, making it to the Final Four in the men’s division are Florida State University, Georgia State University, and Saint Mary’s College of California. Georgia State squeaks by Saint Mary’s to advance to the final, and in a Sunshine State battle, UCF overtakes Florida State and wins the 2019 championship. California dominates the women’s division, with three teams advancing to the Final Four: UC Berkeley, UC Davis and UCLA join the University of Central Florida in the semifinals. In a narrow victory over UCF, Cal advances to the final to face off against UCLA. UCLA outscores UC Davis in the other semifinal and is ultimately victorious in the 2019 championship match. Clutch Performers (Access Gap and Graduation Gap) — Men’s teams: Georgia State and North Carolina Central have negative access and graduation gaps, meaning they enroll and graduate underrepresented students at higher rates than non-underrepresented students. Women’s teams: Bethune-Cookman and Southern University have negative access and graduation gaps, putting their teams ahead of the others in these categories. Blue Chip Talent (Low-Income Students Served) — Men’s teams: Prairie View A&M leads the way with 65 percent of its students receiving Pell Grants. Women’s teams: Bethune-Cookman comes out on top in this category, as 76 percent of its students are Pell Grant recipients. Traditional Powerhouse (Underrepresented Student Graduation Rate) — Men’s teams: Yale leads the pack with a 97 percent graduation rate for underrepresented students. Women’s teams: Princeton dominates this category with a 95 percent graduation rate for underrepresented students. Our 2019 champions — UCF and UCLA — came out on top to claim the Equity and Student Success title because they enroll, serve and graduate significant percentages of underserved students, including low-income students and students of color. These institutions’ dedication to equity and student success is evident in the supports they provide their students. The American Talent Initiative and Campaign for College Opportunity recognized UCLA last September for its dedication to helping community college students transfer to and graduate from four-year institutions. The University of Central Florida’s Knights Helping Knights food pantry celebrates its 10-year anniversary this year. 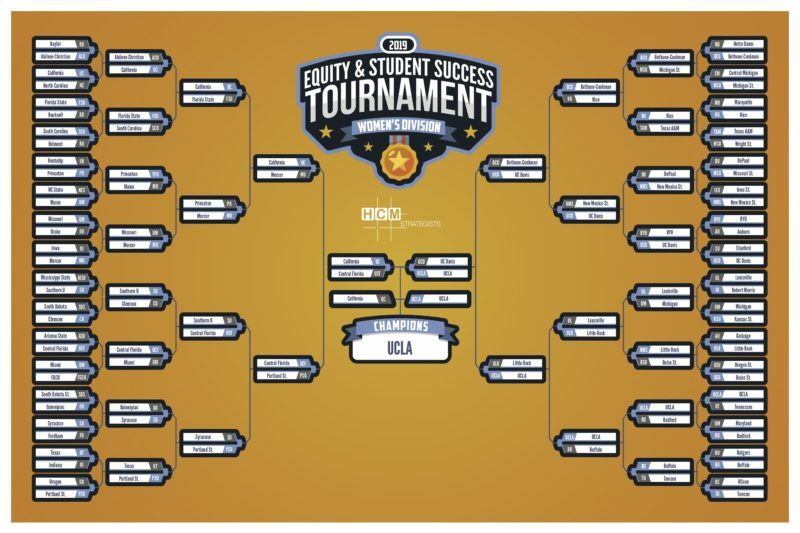 These are only two examples of the ways UCF and UCLA are working to close equity gaps and promote student success; however, we hope our bracket sparks conversations that focus on ways that other institutions can also implement supports to help students succeed. We recognize that our methodology is inexact. Our index, for example, does not take into account affordability, student debt or job placement rates for the schools — factors that can significantly affect students’ lives. However, we hope that our Equity and Student Success Tournament highlights other areas of higher education that also deserve national discussion and focus. This story about student success in higher education was produced by The Hechinger Report, a nonprofit, independent news organization focused on inequality and innovation in education. Sign up for our newsletter. 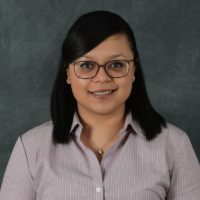 Elizabeth Salinas is a senior associate for HCM Strategists’ postsecondary policy team. She is dedicated to identifying and eliminating equity gaps in higher education. A specialist in research and data analysis, she provides strategic guidance for multiple HCM clients. 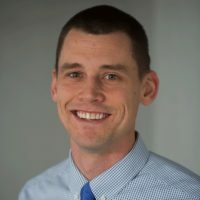 Scott Boelscher is a senior associate with HCM Strategists’ postsecondary policy team, providing clients with high-level strategic advice in the areas of state policy, strategic finance planning, funding formula development and implementation and financial aid. 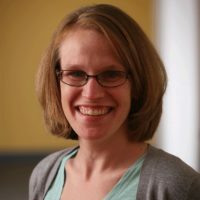 Martha Snyder is an education policy specialist with high-level experience supporting federal and state policymakers. At HCM Strategists, she provides policy expertise and strategic counsel on a wide range of areas, from finance and accountability to college readiness and affordability.